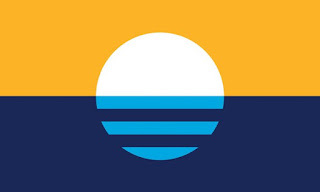 The design, titled "Sunrise over the Lake," is meant to symbolize a unified future, Lenz said in a May interview. The three light blue stripes in the sun's reflection represent the city's three rivers and founding towns. The gold background is a nod to the city's wheat growing and brewing history, and the rising sun above the lake represents a city united. Fortunately, the flag isn't an official replacement of the old one - at least not yet. But before the city would consider it, they better run it past their corp counsel first. My other question if, God forbid, the city would adapt this thing as the official city flag, would they change the name of the city to the City of Corona, Wisconsin? The proposed new Milwaukee flag also bears a resemblance in shape (but not in color) to the Australian Aboriginal flag.